ESA Letter Review: Every possible reason, besides valid ones. Premium Emotional Support Animal Letter Superstore. A very memorable, and very worthless emotional support animal letter. The author wrote a book, just the wrong book, as the letter does nothing to address the client’s disability and disability related need. Author worries about client’s safety, rails against the property’s management team, and brings in the ADA. Which, unfortunately for their client, has nothing to do with an emotional support animal letter. Also, anxiety is not a disability (as per HUD’s guidance). 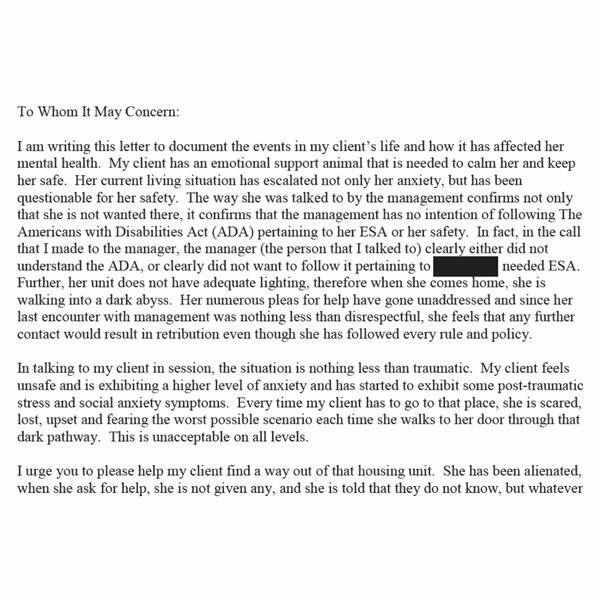 The letter does not verify the client’s disability or disability-related need for a dog, as required by HUD guidelines. ESA Letter Review: The MD’s Grasp is Tenuous at Best. ESA Letter Review: An ESA cannot go out in public. ESA Letter Review: Huh, What? We Work Harder Than Hard. Our amazing authentic reviews are not by accident, as we provide extraordinary service to each and every client. Getting a genuine ESA letter is simple! Place an order, take an online mental health exam, and speak with a local licensed clinician who will approve your order. Enjoy same day service, amazing client care, and state of the art protection for your protected health and financial transaction information. ESAD has hundreds of licensed clinicians across the globe plus online ESA training and certification, amazing customer reviews, and a team of industry experts who make it super easy to find a genuine ESA letter that’s right for you. ESAD is a referral service for local licensed mental health care professionals. Copyright © 2019 ESADoggy.com. All Rights Reserved. Due to privacy concerns, images on the site may include actor portrayals of therapists, clients, and dogs. If you, or anyone else, is in a crisis or may be in danger - do not use this site. These resources can help, or call 911.